The Pierre, SD March for Moms is sponsored by Apple Tree Midwifery. Sign up to help us in Pierre! Or use the donate button on our homepage. It has been an incredibly exciting session. Our bill has officially been signed into law, so now what? First up: we will get an official photo with the Governor reenacting the signing of our bill. Anyone can be in this photo, and we are hoping for a lot of you to be there – all are welcome! It will be at the Capitol on March 27 at 9:30 am. If you are coming, please meet us in the Rotunda (2nd floor) by 9:15 am. Second: Following the photo on the 27th, we will have a potluck and planning meeting for our CELEBRATION PARTY! It won’t be at the Capitol, though, so keep your food in your car and we’ll give you all directions after the photo. All are welcome to come help with the planning. Third: The Celebration Party is tentatively set for May 13 in Pierre (central location for the whole state). Pencil it in on your calendars, and be watching for further details! We want to plan a celebration that the whole family can enjoy. Please share your ideas! Fourth: After our law goes into effect on July 1, the Governor will appoint the board. Then the board will develop rules to regulate CPMs and help those rules navigate the rules process which includes public hearings and a hearing with the Legislative Rules Committee. This process can take awhile, so CPMs won’t be able to practice immediately when the law goes into effect on July 1. We are confident that the process will go as quickly and smoothly as possible, and we will have CPMs providing care in our state as soon as they can! WOOHOOO!! From the bottom of our hearts, we want to say a huge thank you to all of you, our followers and supporters. Without your efforts in contacting legislators, helping with our luncheon, coming to Pierre to visit and lobby, PRAYERS, etc, etc, we couldn’t have pulled this off. We’ve been working for so many years *because* we care about you, South Dakota families, and your birthing rights and options. Most importantly, this post absolutely wouldn’t be complete without giving God the glory. There were SO many little (and big) miracles and orchestrations along the way this year, and those of us spending time in Pierre felt His presence and peace all along the way. He had us and our bill in His Hands and without Him and all of YOUR PRAYERS, we would not have been able to do this. WAY TO GO, SOUTH DAKOTA!!!! Families will benefit from your work for years to come! Families across South Dakota are rejoicing that the South Dakota House of Representatives passed SB136, to license and regulate Certified Professional Midwives, with a vote of 52-16. This happened on March 1 the 25th birthday of the baby whose birth began this long journey. You can read more about this historic vote in the March 3rd Argus Leader article entitled Home Birth Advocates Near Historic Win. We have met with the Governor and he has pledged to sign our bill. This will happen within the next 5 days and will make South Dakota the 32nd state to authorize the practice of Certified Professional Midwives. The Governor’s office will be scheduling a time on March 27th for us to take a signing re-enactment picture with him. Everyone who has helped in this effort over the last 25 years is welcome to come and be included in the picture. We are planning a potluck lunch that day and a meeting to iron out details on a Family Fun Day Victory Party later this spring. If you would like more details about any of these events please email us at info@sdbirthmatters.org. More details will be posted on our Facebook Page as they become available. A huge thank you to all of you who helped this year and all those who have helped in the years leading up to this epic win for home birth families. On February 13th, the Senate Health and Human Services committee approved SB136, the act to license and regulate Certified Professional Midwives, on a vote of 4-1 after a two-hour hearing. The photo shows some of our supporters who came to take part in the committee hearing. Two days later the full Senate debated the bill and passed it over to the House with a vote of 29-6. Reporter Bob Mercer covered the story and it was run in many local papers. 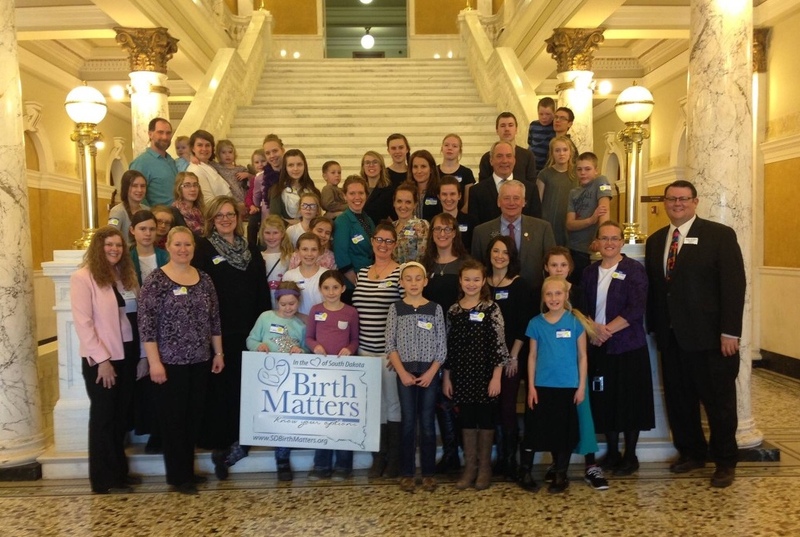 You can view his article here: With Senate’s ok, South Dakota looks to license midwives. Now our supporters are gearing up for a hearing in the House Health and Human Services committee at 7:45 am on Tuesday, February 28th. If we are successful in passing the committee, we expect SB136 to be debated on the House floor the following day. Please check our Facebook Page or join or Facebook Group to get all the details of how you can help make South Dakota the 32nd state to authorize the practice of Certified Professional Midwives. We did it! We all came together and reached the monumental goal of raising $20,000 to fund a midwife board to license Certified Professional Midwives in South Dakota. A huge thank you to everyone who made this possible. Now let’s finish strong as we move through the legislative process. Our bill was first read on the Senate floor, assigned a bill number and committee. After passage of a committee, the bill will get it’s second reading on the Senate floor where it will be debated and voted on. We anticipate our bill will get a floor debate on February 15th. The floor session begins at 2pm. Our bill will need 24 of the 35 Senators to vote Yes in order to pass. If it passes it will have its first reading on the floor of the House the next day and be assigned to a House committee. That committee chair will schedule a time for it to be heard in committee. If it passes the committee (need 7 of 13) and the House floor (need 47 of 70), it will go to the Governor who can sign it, veto it, or let it become law without his signature. In every step of the process we need your engagement. Your visits with legislators,calls, letters, emails and phone messages are crucial to the passage of our bill to assure South Dakota families have access to Certified Professional Midwives. Please consider attending a legislative forum in your area and asking your legislators if they will support SB136 which will give South Dakota families access to licensed Certified Professional Midwives. Happy New Year to you and your family! While we still have a lot of work ahead of us, there has never been a more favorable climate for passage of a bill to license Certified Professional Midwives in the twenty plus years that I have been advocating for this option. Our prime sponsors are in key leadership positions. The committees where we are usually assigned are supportive. Many supportive legislators moved to the Senate. We have the opportunity to educate many new legislators in the House. The Board of Nursing and Dept of Health worked with us to craft our bill. We have a great start to our fundraising campaign. Contact your legislators and ask them to support the Midwife Bill. Sign up to help with our Legislative Luncheon and Advocacy Day on January 17. Take part in our #MoreMidwives4SD campaign. If you have any questions about our bill or how you can help, please don’t hesitate to contact me. Thanks for helping make 2017 our year!